Somebody is having an all you can eat lobster buffet thanks to Tyler Perry. According to Gawker, a man has gotten away with 35 lobster tails and production staff need your help locating the missing crustaceans. ALERT: We have received reports of a luxurious catastrophe on the set of Tyler Perry’s OWN soap opera If Loving You Is Wrong. “Approximately” 35 lobster tails are missing and nobodyknows where they are. If you have any information—any at all—that could lead to the recovery of pounds upon pounds of succulent lobster meat, a newfound life of wealth could be yours. The following email was allegedly sent out to those working on the show’s Atlanta set. It is a very serious email and not a drill. 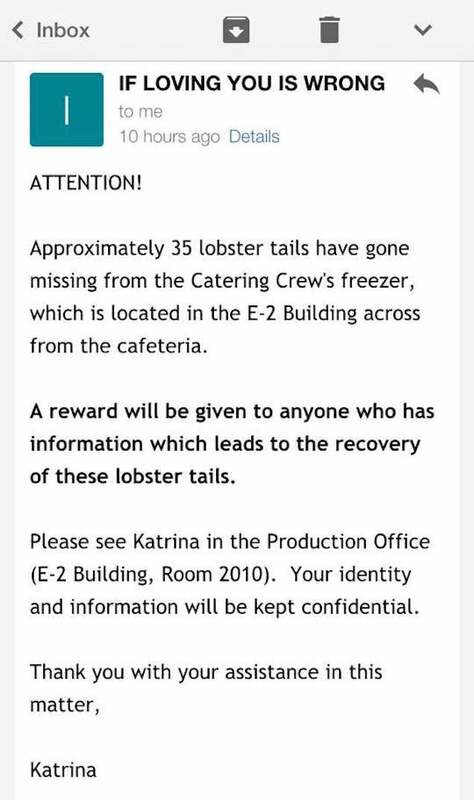 Please contact Katrina if you have any details surrounding the missing lobsters.